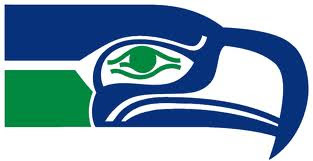 Makes me wonder once again: is there another professional (or any other athletic team for that matter) that actually has a "real" piece of art as a logo, such as the Seattle Seahawks have in the above Pacific Northwest art piece? Holy rainy city Batman! The Seahawks are going to the Super Bowl!!! !